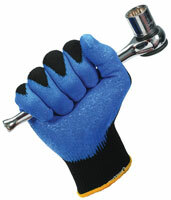 The Jackson Safety G40 Nitrile Foam-Coated Glove has been improved and now is blue instead of purple. The glove has better oil- and industrial-grease grip, is washable, and maintains EN388 ratings through at least five wash cycles. The improved heat transfer stamp means the ratings can be seen even after use.